Truth be told, I have been avoiding this post for a long time. Norway was the second-to-last country I visited while abroad, and I have been home for a little more than two months now. Things haven’t been the same upon my return; this post solidifies the idea of my big adventure being over. I finally gained the courage to write about my time in Norway because I have to face reality. Although the best chapter of my life is now closed, I know more opportunities will come! I miss Europe, traveling, and my life abroad, but this drives my determination to find a job overseas even more! My view for two weeks! I left Kalmar, Sweden extremely saddened; I was leaving not only the best part of my life behind, but also several new friends from around the globe! However, with that said, I knew that my two-week stay in Norway would be a great transition into my normal life back in Michigan. I visited Norway for two main reasons: 1. It has always been my “dream country” and 2. While my mom was in high school, her family hosted a Norwegian exchange student! His name is Kjell and I was FINALLY able to meet him and his (entire) family! It was such an incredible experience to meet a family I have been connected to through my mom’s stories, letters back and forth, and a montage of photos and Christmas cards over the years. When Kjell and his daughter, Martine picked me up from the airport, I instantly felt at home. I remember walking with my heavy backpack down this long flight of stairs to pick up my luggage, and as I looked down I could see them waving up at me with Norwegian flags (was it THAT obvious I was an American?)! My heart was full in that moment. Kjell and his family live on the beautiful island of Askøy, which is about a half-hour (not even) from Bergen. It was a surreal feeling to drive Kjell’s boat to Bergen and several other small islands in the area. When I travel, I often find parallels between cities I have been to. Oddly, I found similarities between the countryside of Southern France and the route to the Cliffs of Moher in Ireland. 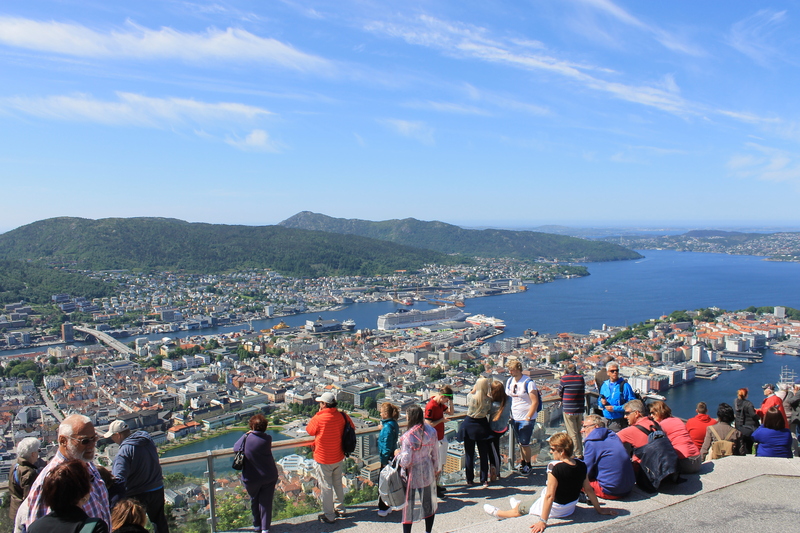 I cannot compare Bergen to anywhere else; it is truly one of a kind…just like my time in this beautiful country. The first few days of my new adventure consisted of visiting mainly Bergen, and you know, the typical tourist-y stuff. Although I try to avoid cliche attractions and events, there are exceptions. I had to visit Bergen’s famous fish market and visit the highest point of the city! The market didn’t smell the greatest, but the taste of the fresh fish from the North Sea made up for it. How could I miss this view?! With Martine and Kjell, I was able to take the Ulriken cable car to the top of Mount Ulriken. Because of all the islands and mountains in this part of Norway, the Ulriken wasn’t the only cable car/ski lift I traveled on. The city of Bergen itself has a rich viking history, something Kjell takes much pride in. During my first visit to Bergen, Norwegian royalty were near Parliament and university buildings. Kjell is a police officer in Bergen and Askøy, so he was hoping we would have a better chance of seeing the royalty if he was talking with his friends and coworkers! It was a good strategy, but unfortunately I didn’t meet a prince or anyone close. I would have to say that my favorite thing about Bergen (aside from the food and people) are the Bryggen that greet you as you ride into the city by ferry or boat. Inside the wooden buildings, there is a famous nightclub and also a traditional Christmas shop. I live near Frankenmuth, Michigan (a faux-German town with a world-famous Christmas shop), and I was impressed with the Julehuset in Bergen! My boat rides with Kjell were some of my most cherished memories of my time in Norway; I was able to learn more about Norway, his family, and even my own family through Kjell’s stories. I will be sure to share more stories and photos in other blog posts! This is only a mere sample of my Norwegian adventure.